The answer to that question is fairly simple, and based on ongoing research. In the 1970s, not much was known about the paint schemes of early locomotives, and both replicas were painted bright red. We now know that bright red locomotives were virtually nonexistent at the time. 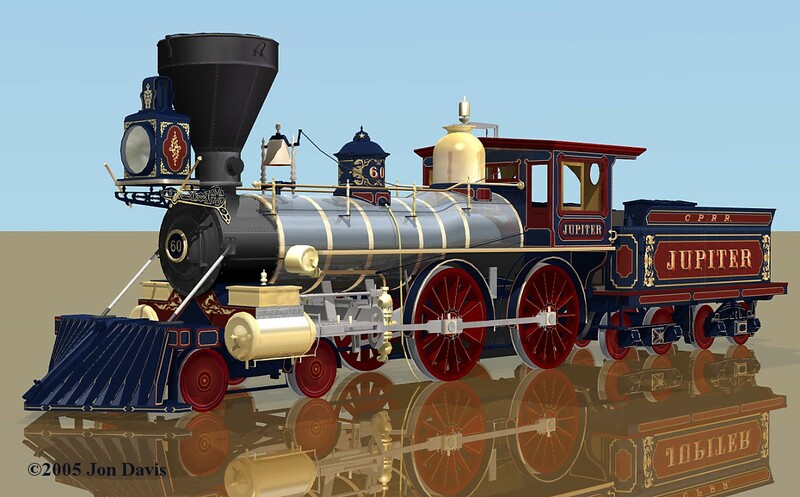 In 1994, new research into early locomotive paint schemes, and a contemporary 1869 newspaper report describing Jupiter's colors as "blue and crimson with gold" led to their repainting. Jupiter's scheme was based on what was then known about blue locomotives, while the 119's scheme was largely hypothetical, but based on common practice at the time and additional research into photographs of the engine when new. Today, ongoing research has brought new information that the NPS is incorporating into a study which will guide future repainting of the replica engines when funding allows. Jupiter's blue is now known to have been much darker, and the hypothetical 119 scheme was discovered to be, in fact, largely accurate. The original locomotives were built at a time when engines were commercial products, and reflected the ideas and preferences of the factories that built them. Locomotive builders knew that attractive engines reflected well on their image, and accordingly chose individualistic "trademark" color schemes to promote their product. Jupiter was built by the Schenectady Locomotive Works of New York State, whose Scottish management employed the blue and crimson colors of Scotland's Caledonian Railway – blue is the national color of Scotland. The same scheme was employed upon the banners of the largely Scottish 79th New York Volunteers, known as the "Highland Regiment." Blue and crimson was not only used by Schenectady, however, and the Brooks Locomotive Works and the Rogers Locomotive & Machine Works also turned out engines in various blue and red combinations. The No. 119 was built by the Rogers Locomotive & Machine Works of New Jersey, which typically painted its engines either green or wine color with vermilion (a bright orange-red) wheels. Wine color was used for "better finish" engines like No. 119, usually with green or ultramarine blue panels on the tender and vermilion number panels, as well as gold striping on the tender and engine frames. Photographs of No. 119 clearly show the tender frame striped in gold, indicating that the engine was painted in wine. New information has also shown the actual placement of the panel colors on the tender, the reverse of their current positions. I have a HO layout and I have the Generial and the UP Steam Locomotive with Passenger Cars! When I read the Artical about the two locomotives where they meat and the Generial wasen't the first choice, I was very interested! 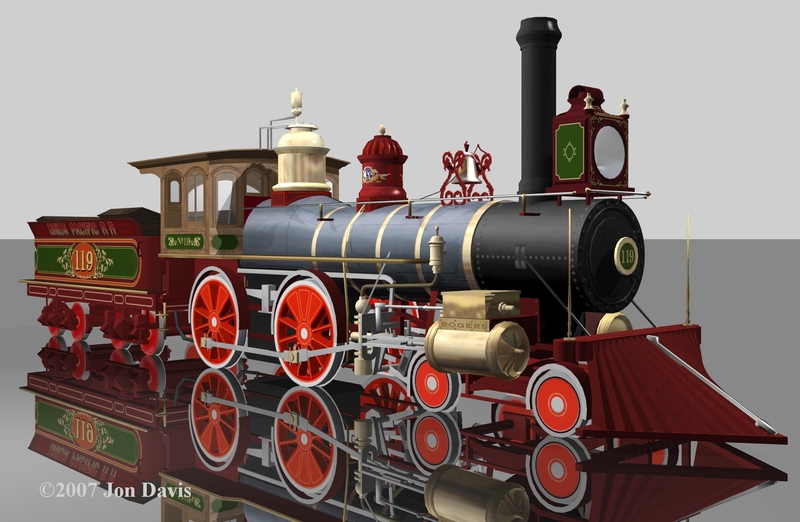 When I found out that the 1867 Antelope locomotive was suspose to be there and because of a accdent the generial went instead I was very interested.So I found at your Museum a picture of the Antelope but there is no place that tells of the color of the engine are the wood tender? That since most of the locomotives of the time were very nice and colorful, I wanted to make one of my extra locomotives the same as the Antelope! Can you possibly help me in this quest?